Managing life with a medical kid is a constant work in progress. Things are always changing and shifting and what works right now, might not always. In spite of that, here are a couple of things that we have found to be helpful in keeping life a little bit more organized. It is a free multi-platform app that allows you to create health profiles for multiple family members and keep track of things like appointments (including places to write questions for upcoming appointments and summaries for completed appointments), providers (and contact info), health conditions, active/inactive medications, allergies, height/weight and all other vitals, and it has the ability to scan/upload documents into the app (like the paper reports we get after each specialist visit) and fax documents (like med lists) from the app. VERY handy! You can also use it to set daily medication reminders or health related daily tasks. Prior to discovering this app, I was keeping lists of most of these things in Google Docs, but it was fragmented and I had to share each individual document with Josh and if anything ever happened to me, he’d have to go searching for all that information to compile it. This way, even though Josh doesn’t usually need to access her medical information, it is all easily available to him in the event that he does need to. I keep profiles for the rest of us, too, though they are not NEARLY so detailed. It helps to be able to look up what meds Josh is on, if we are away from home and he needs the information. I will admit that I don’t keep this app nearly as up to date as I keep the everyday use calendars and should probably schedule a time once a month to add information and make changes as needed, but it is way more comprehensive and updated than the Google Docs system was. It is a great alternative to a paper-based medical binder, which we’ve tried in several different incarnations over the years and just couldn’t really stick with. They also have a paid option, in which they gather and import ALL your medical records and set everything up or you…but the free version is thorough enough for us! Although K has been pretty stable health-wise, she has had an increase of symptoms (such as pain) in recent months. It was becoming difficult to keep track of what complaints she had and how often they were occurring, so we implemented a new checklist system for her. We either have her fill it out before bed or in the morning (for the previous day) and it works well. This one is specific to her presentation and symptomology, but it was pretty simple to set up. I can also make notes of tweaks we make to her routine (like increasing fluids or starting/stopping a medication or supplement) on a day to day basis. We’ve only been doing this for a few months, but it has made us more aware of what is going on with her on a regular basis. A lot of times, she wouldn’t mention things until they had been going on for a long while and then say something like, “My legs hurt.” out of the blue and when we asked her more about it, she’d say, “Oh, they hurt every day. I didn’t tell you?” I think it is handy for kids who are old enough to be self-reporters and gives us a better picture of how she feels every day. Thanks for this! 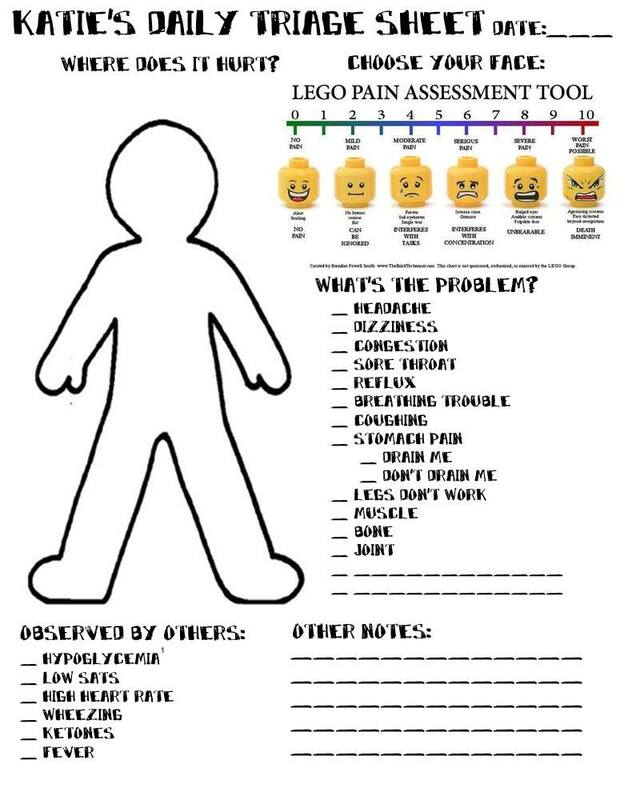 I’m a pediatric PT, and I’m going to share the app info with some of my parents, and I want to look into the Lego pain guide for work! I also wanted to ask you if you sew at all, if you want some so I monkey fabric I have! I bought it for a project that never got done. It’s not a lot of yardage, and I need to find it! But if you are interested, email me and I can mail it to you! hi how are you? how’s the baby?